The MTCR outreach mission to the Republic of Singapore was held on February 23rd, 2017. The MTCR delegation was led by the MTCR Chair, DG HAM Sang-wook, and consisted of representatives of the MTCR Troika, including previous Chair Ambassador Piet de Klerk, MTCR Point of Contact, Technical Experts Meeting, and other MTCR Partners. During the outreach meeting, the MTCR delegation updated Singapore on recent trends in the Regime and was briefed on Singapore’s export control system. Both delegations actively engaged in discussing various export-control issues such as intangible technology transfer (ITT) and 3D printing technology. 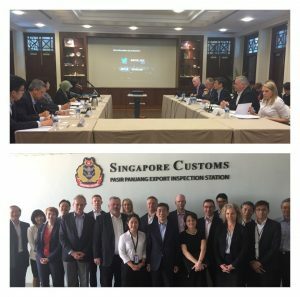 Following the outreach meeting, the MTCR delegation visited the Pasir Panjang Export Inspection Station (PPEIS) and had a chance to meet with custom officers who actually conduct inspections at ports.